Swaying palms, hula skirts rustling and tasty drinks makes everyone here want to dance, and Waikiki definitely lights up at night with a variety of clubs. Follow the velvet rope to the most exclusive of Honolulu nightclubs. You never know what surprises await – the-most-buzzed-about DJs drop in to guest-spin (including Hawaii’s own DJ Anit and DJ Compose). Celebs, lured to the island by the beach, naturally find their way to ADDICTION. (Those in-the-know let ADDICTION lure them here and find the beach later.) 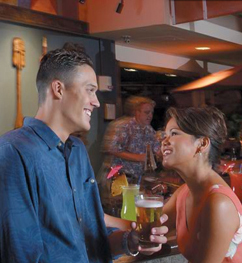 Ours is the A-list guest list among clubs in Honolulu. Dance beneath 40,000 lights, or sink into a seat and drink in the scene. Intimate groupings throughout let you lose yourself in the night. The level of service, a signature of THE MODERN HONOLULU, is uncommon among clubs in Waikiki – reserve a VIP table or plan a private event at ADDICTION for the ultimate experience. The weekend starts early with #WeekdayWarrior on Thursday nights! Featuring DJs Compose, ANIT, and SSSOLUTION, complimentary cover charge for industry guests with specials on VIP packages, including Tito's and Belaire Champagne. .